My S41 review unit which was provided by Dynamism came equipped with 2GB of RAM, double that of the 1GB OEM configuration. The S41 only has an 800mhz CPU, which I didn’t have high expectations for, but I was certainly surprised at its ability to run Vista. For the formal unboxing, see this post. Front (left to right): Volume rocker, headphone jack, mic Jack, SD/Memory Stick reader, LED indicators (Battery/HDD/Num Lock/Caps Lock/Scroll Lock), Wifi radio switch, CF slot. Left Side: Kensington lock hole, LAN port (with cover), VGA, fan output vents, 2 USB Slots. Right Side: Power switch, DVD drive (air intake vents above), power indicator LED, AC-in, (another) Kensington lock hole. 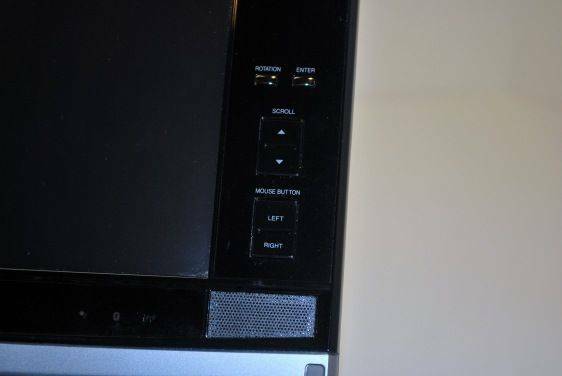 Left Screen Bezel: Brightness up/down buttons, 4 way D-pad, thumb-mouse, left speaker. After pulling the S41 out of its box and plugging in the AC adapter I turned the unit on to see a short BIOS boot sequence (Phoenix BIOS in case anyone is interested), followed by the setup wizard of Windows Vista Home Premium. After configuring a few things that Vista asked me to, the unit took about 10 minutes to finish setting up. From there I saw the desktop which luckily wasn’t covered in bloat-ware icons (possibly thanks to Dynamism). The only icons on the screen were the Recycling Bin and two icons from pre-installed tools (CoolPlus and PenMount Control Panel). I haven’t used a tablet PC before so I took some time to get used to Vista’s tablet features which were already turned on. The floating ghost mouse was a bit annoying even though it provided some nice functionality. I ended up turning it off. As most people will tell you, Vista’s handwriting recognition is excellent. Unfortunately my unit was missing its stylus so I didn’t use the computer in tablet mode as much as laptop. When I was using it in tablet mode I borrowed the small stylus from my UX180. The first thing I did after getting a feeling for the computer was download Firefox 3 and configure important addons like Foxmarks, Grab and Drag, and Google Gears. When I first picked up the S41, it felt like one solid unit in my hand which was very nice. I know some tablets have the tendency to have a weak hinge that results in some wiggle on the screen. That was not the case with the S41. Both the lid hinge and screen rotating hinge were strong and contributed to the solid feeling of the device. The battery didn’t have any wiggle which was good as well. 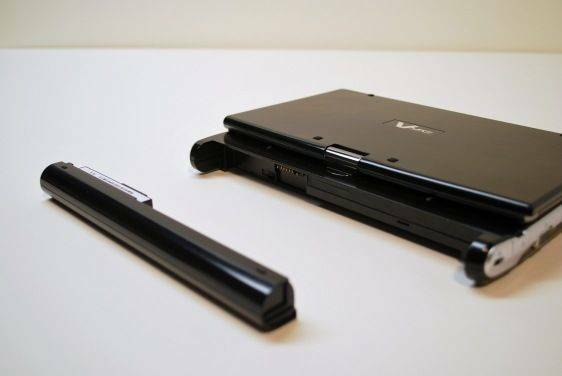 The battery overhang on the back functions well as a handle. 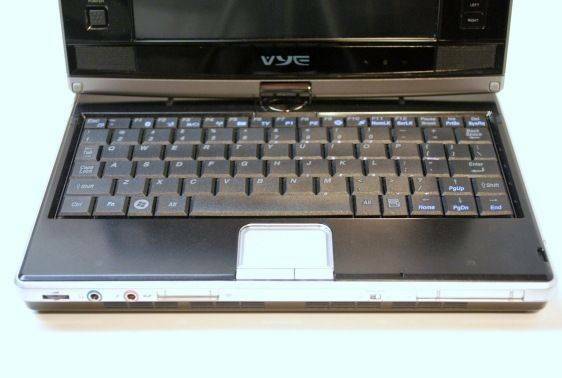 There are small pads on the front and back of the lid that ensure that the unit doesn’t scratch itself when rotating the screen, and while the screen rests on other parts of the computer. The unit has a poly-tone black metallic looking finish that falls right in the middle of the matte <–> glossy spectrum . In the right light you can see multi-colored sparkles of the metallic looking finish; pink, green, orange and red sparkles can be seen. The unit makes a great dedicated Google Reader by simply using the S41 in tablet mode, rotating the screen 90 degrees, and using Google Reader’s iPod Touch site (www.google.com/reader/i) with Firefox in full screen mode. 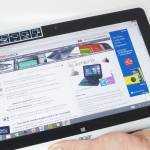 Grab the battery overhang as a handle and you have a perfect Google Reader with an interface suitable for touch input. I could see this being a good ebook reader as well, however the screen doesn’t work well in outdoor light. 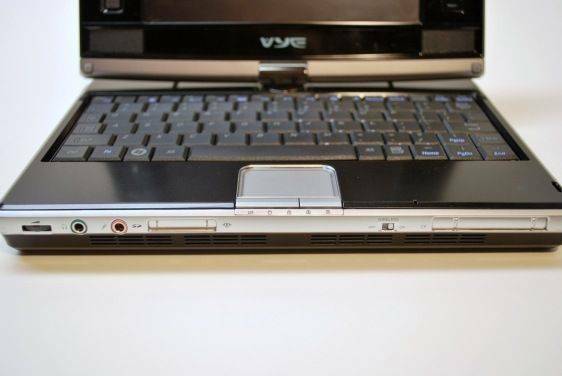 The S41 is equipped with an arsenal of hardware buttons which for the most part do their job well with the exception of the brightness buttons which didn’t seem to work, I assume Vista is cause of that. The thumb-mouse to the left of the screen works pretty well when you are using the S41 in tablet mode. If you are going to be using the thumb-mouse, I would suggest that users play with the mouse acceleration settings until it feels right for them. Some people aren’t fans of the thumb-mouse but with a little practice they can be very helpful. I didn’t have a CF card to test the CF slot, but it lacks an eject button just as the SD/Memory Stick card slot does. Throughput of the SD slot seemed standard, but removing the SD card was actually difficult because it was almost flush to the face of the device and there is no eject button. The speakers built into the screen work fine for audible notifications, but aren’t really any good for music listening, the quality is rather low. I would prefer using headphones plugged into the conveniently placed front jack for watching a movie or listening to music. The trackpad is about half the size of a standard trackpad, and seems to work well for navigating the mouse around the screen. The very sides of the pad are supposed to work as scroll areas, however they functioned very inconsistently in both Firefox and IE. The mouse buttons have a crisp click to them and are easy to press. The left mouse button is larger than the right occupying about 2/3 of the available space. The right mouse button takes up the last 1/3, and both are easy to get to using the index finger on the trackpad, and the thumb to press the buttons. The 7 inch screen, which runs at 1024×600, is a great size/resolution combination. I didn’t ever need to zoom in to any text. The screen is average in its brightness and sharpness. If you look closely you can see some blur which I believe is a result of the passive touch screen, however the blur is minimal and is nearly unseen when you are concentrating on the screen’s content. The screen has a glossy finish, and reflections are what would be assumed from a glossy screen. There wasn’t any situation where reflections were a problem, but I’m not using the unit outside any time soon. The amount of pressure required for the screen to accept a touch input seemed to be in the medium area. It required more pressure than the N810, but less than the UX180. The keyboard was not as bad as I thought it would be. The keys have a nice graphite look to them and aren’t too crowded with multiple key bindings like on some other UMPCs. They have a good travel distance and feel just like regular laptop keys. Nearly all of the keys remain intact on the S41’s keyboard. A full row of number and function keys are present and there is a shift key on both sides of the keyboard. The shift key on the right of the keyboard can cause some annoyance especially for someone who writes often. It is directly right of the up arrow key, and is only the size of one regular key, as opposed to the left shift key which is about 1.5 keys. The problem I had while getting used to typing on the keyboard would have been a nightmare without the undo function. What happens is that when you go to press the right shift key, it is common to accidentally hit the up arrow at the same time because they are so close together. This results in a line of text being highlighted, and the next key you press overwrites the highlighted text. This can be frustrating but becomes less of a problem with more practice. The size of the keyboard means that you won’t be using standard full keyboard strokes, you will most likely end up altering your typing style to be able to type more efficiently on the S41’s keyboard. The keyboard is not too small to do some writing on. I spent five days using only the S41 for ultra mobile PC Portal posts, and during that time my proficiency with the keyboard increased quite rapidly. I couldn’t recommend the keyboard to someone with larger fingers, they would probably have some major trouble with it. As for me and my small-medium fingers, it works well considering its shrunken size. Would I want to type this entire review on the S41’s keyboard? Absolutely not, but it is good enough for short posting , URL typing, and IM/emailing. One thing that I missed from my UX180 was backlit keys. 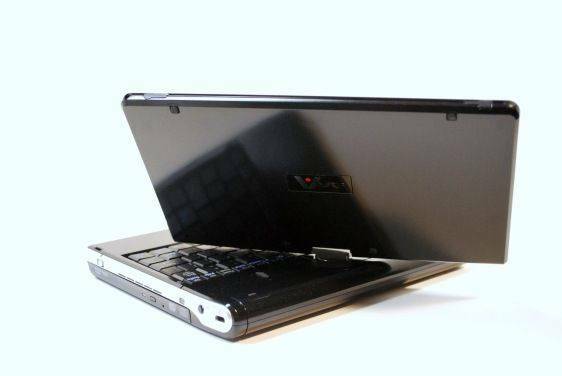 With a full sized laptop, the screen often provides enough light to see the keys even in a dark room. Unfortunately for the S41, the screen is not large enough to provide that brightness, and it can be tough to see the keys in a dark room. Tilting the screen down to light the keys works ok, but it will of course make the screen harder to see! As I mentioned before, I was surprised how well Vista Home Premium was handled by the 800MHz CPU, especially considering that Home Premium’s system requirements list a 1GHz CPU. You must think of this relatively though, while I was impressed by the performance of an 800MHz CPU, this is not by any means a powerful computer. Navigation of the OS was snappy enough and I didn’t feel any hang time while waiting for windows or menus to load. I feel that the 2GB of RAM helped greatly with the performance of Vista. Navigation may have been fine, but heavier tasks like adjusting photos in Windows Photo Gallery ran somewhat slow. That much can be expected when you are working with 800MHz of processing power. I was disappointed to see that inertia scrolling with the Grab and Drag Firefox addon didn’t look very smooth while running on battery. Plugged in and using the full power of the processor, scrolling was smooth for the most part. Now for some numbers. First we have the Vista Experience Index. The score is determined by the lowest scoring factor; in the case of the S41, the weakest link in the chain was the CPU. 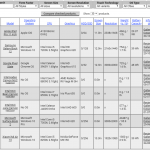 This is no surprise as the 800MHz CPU doesn’t even meet the system requirements of the OS. I was pretty surprised by the RAM and HDD scores. The Vista Experience Index score ranges from 1-5.9, so seeing a 1.8″ HDD score a 4.4 is pretty impressive. RAM was also quite fast grabbing a 4.6 score. The only problem here is that when the weakest part of your setup is the CPU, things can bottleneck in that area very fast because nearly all aspects of the system have to pass through the CPU. YouTube videos run fine on battery in regular and full screen mode. They keep the CPU around 80% usage while they are running. The S41 struggled very much with h.264 flash video from Gametrailers.com where it would display the video extremely choppy, so much so that they were unwatchable. Luckily DVD playback through the built in DVD player works without a hitch in Windows Media Player. Unfortunately there is only about enough battery life to watch one feature length DVD. I tested the DVD player and battery with the movie Pitch Black which has a run time of 1:52; with the screen at half brightness, and wireless radios turned off, the S41 hibernated shortly before the end of the movie. So about that question we asked earlier, do you really need a DVD player in a computer of this size? 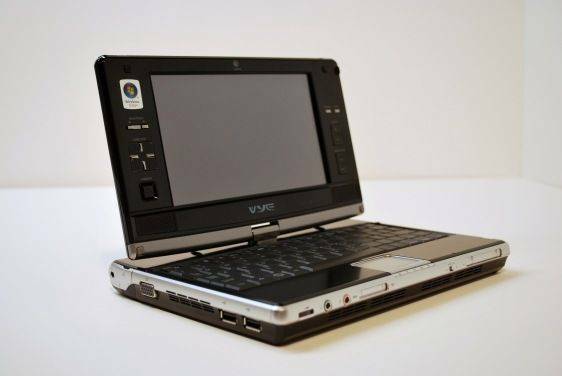 If it were my choice I would have dropped the DVD player to add additional features such as 3G connectivity, more RAM slots, or even just to make the unit smaller. That of course is personal preference, as someone who works in the cloud I could drop a lot of features from a laptop and still have everything needed to do my work. For others out there the DVD player may be a godsend on a unit this small. I think the majority of users would drop the DVD player in an instant if it meant better battery life. There is not much included software other than a simple web cam utility, touchscreen calibration, and the â€œCoolPlus inch application which, for the life of me, I can’t figure out what it does. There was no included software that uses the built in GPS so I unfortunately can’t speak directly of satellite lock times, but I can say that the large touch screen would make this a decent GPS unit with the right software, but you’ll definitely need a car AC adapter. All of the hardware features are on by default (BT, Wifi, DVD Player, GPS, etcetera) when the computer boots, and that behavior seems to only be configurable through the BIOS. Meaning you can use the keyboard shortcuts to turn off any selection of hardware features, but when you reboot they will be back on. This also seems to happen with hibernate, probably because the BIOS are reloaded when the computer comes out of hibernate and turns the features back on. I see this as being a large barrier to user friendly design. To make the user have to enter the BIOS just to configure the important hardware on/off behavior is a bit ridiculous. For those who don’t know how to access the BIOS, they will have to disable the hardware features every time they boot their computer from a cold boot or hibernate. 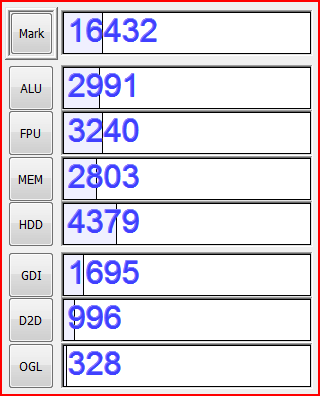 Speaking of booting… here are some numbers from a few boot tests. Vista has excellent standby times, pressing the standby button while the computer is on results in the screen fading to black and the computer entering into a low-power state seconds after. Bringing it back up from standby is equally as fast, the few seconds almost feel instant when you are used to 10 second standby in/out times. The same cannot be said for hibernate. I was really disappointed to see 1:00+ times into hibernation. It is actually faster to do a full shut down and cold boot rather than hibernating and resuming. The RAM and HDD of the S41 are pretty fast so it is hard to fault anything else other than the operating system. I’m just not quite sure why hibernation would be so much worse than standby. Battery life is certainly the S41’s weakest trait, and cripples what would otherwise be a pretty good device. During testing I got around 2 hours of real world use (Vye says the battery is good for 3.6 hours). My usage was primarily using the web browser with Wifi on and other unused hardware features turned off. The unit works well for walking around the house and doing work away from a desk, but 2 hours isn’t enough battery life if you need to be away from a power outlet. Stability of the machine was good, I never had any issues with Vista, and never needed to restart for errors or other strange behavior. One thing that did happen was lots of Firefox crashing. I read an article recently over at JKotR that mentioned Firefox 3 having some issues with tablet PCs and this may be related. 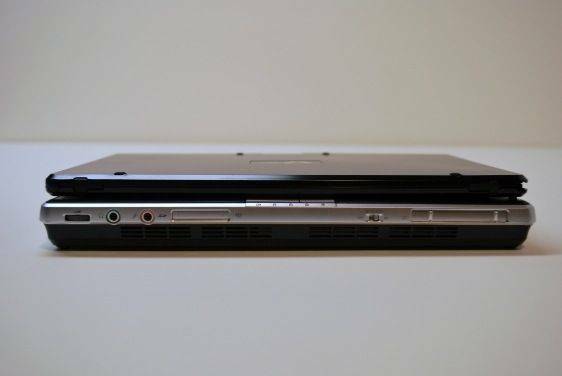 The S41 has a fan behind vents on the left side, and passive air intake on the bottom and right side above the DVD player. The majority of the time the fan is blowing out cool air which allows me to assume that the cooling is fairy efficient. 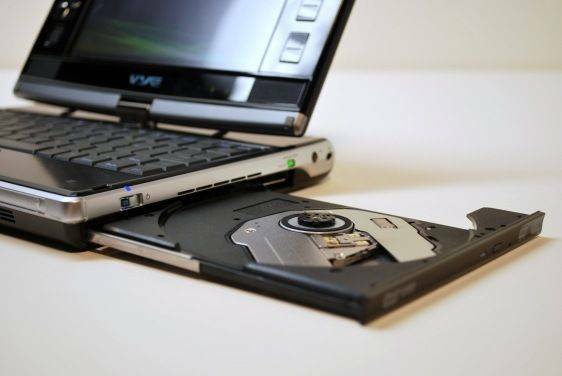 The bottom of the unit does get warm like most other laptops, especially when the DVD playing is running, but it is not discomforting while the device is sitting on your lap. An software option called â€œSilent Mode inch turns the already fairly quiet fan down to an even lower level. This will of course cause the S41 to heat up more, but it will save a bit of battery life and make the unit more quiet. Be careful how long you leave silent mode on though, as heat build up is never good for UMPCs. There is occasionally a lot of audible clicking from the HDD, and this is another thing that seems to be caused by Vista. The included soft case that came with the S41 does a good job at protecting the unit from scratches and other damage that might result from accidents during travel. 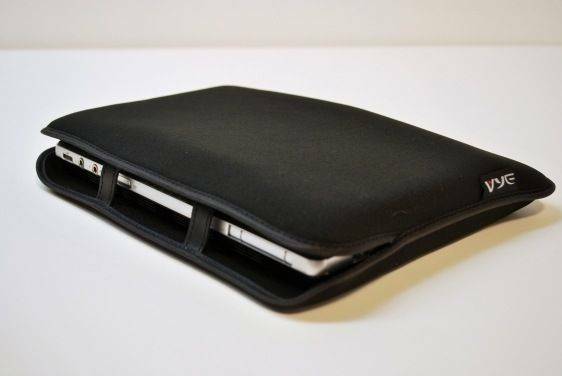 The case is black and very low key in its style. 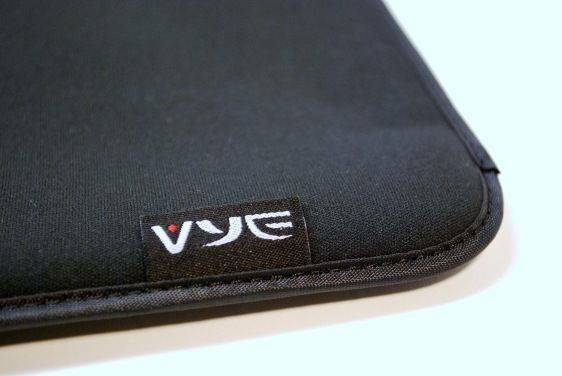 It doesn’t draw attention to itself and doesn’t have many facets except for the velcro-closed stylus sleeve and the a Vye logo tag. The stitching looks even and accurate all the way around. The rather generic soft case, which latches with velcro, adds a minimal amount of value to the S41, but will be certainly appreciated by those who need to take the unit with them when they travel. There aren’t very many other accessories available for the S41 aside from the 6-cell battery which Vye sells directly for $162 USD. Unfortunately the S41 has already succumb to the competition. 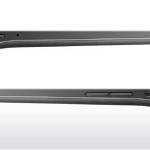 There are cheaper netbooks out there now that are just as powerful, if not more so, and get better battery life. 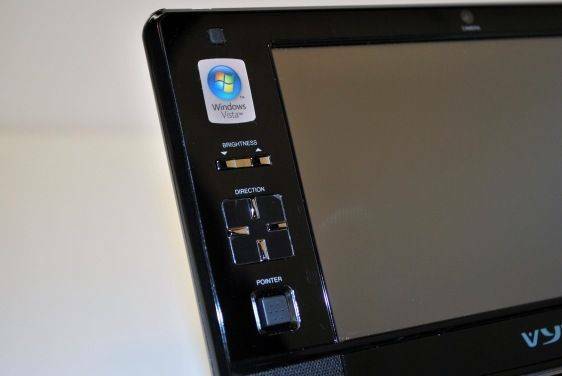 But perhaps if you look at the S41 as the only computer of it size to function as a tablet PC, and somehow still manage to fit a DVD player inside, then maybe you could justify buying this fairly expensive device. The S41 sells direct from Vye for $1499 or through Dynamism for $1379 USD. 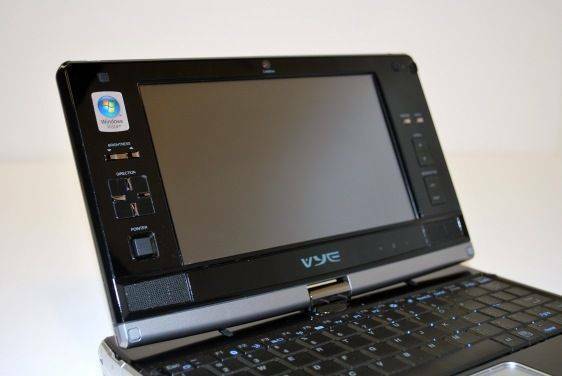 If battery life were not an issue, the Vye S41 would work well as a secondary mobile computer to compliment a larger, more powerful desktop or laptop. 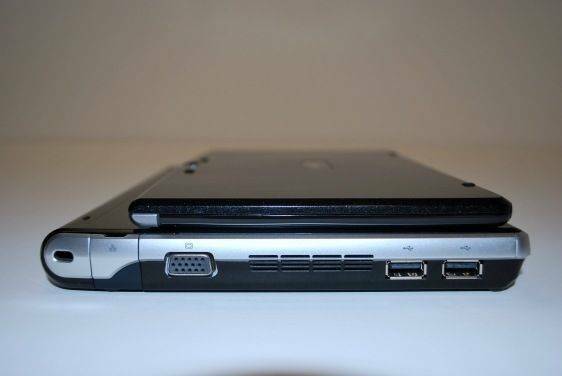 The 6 cell battery may make this mini-tablet a more viable device, but in my opinion you should hang on and keep an eye on ultra mobile PC Portal for the next generation of this laptop, the SX3. Feel free to call this review officially late as Jenn from Pocketables already has a review of the SC3 up! The SC3 is the sister device of the next-gen S41. And don’t miss all the SC3 coverage right here on ultra mobile PC Portal. 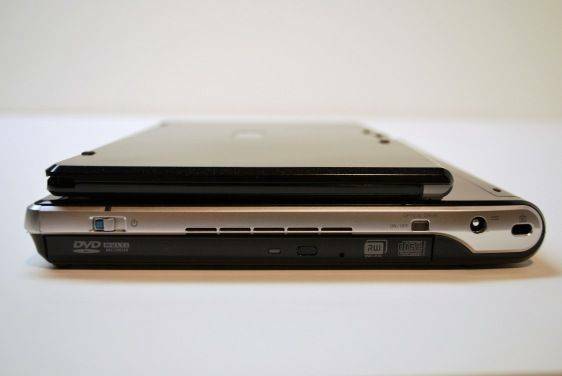 please can you confirm if the sc3 is the next generation of this laptop or if that honor falls to the Kohjinsha SX3, which may also soon be available from importers and is ATOM based. This review is from Ben, not me! The SX3 is the next-gen version of this. The SC3 is much smaller and has no DVD drive. 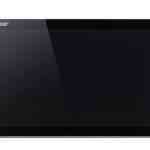 yes, indeed Fujitsu’s U2010 will be better in almost every aspect yet with a similar price tag. Thanks for the review Ben. I was considering this machine as I thought possibly due to the larger size it might have a larger battery, but if the DVD takes up all that space then it becomes a bit pointless. It also seems on all the reviews of UMPCs that no-one makes a good enough keyboard for typing on unless it is virtually full size. So does this mean we shouldn’t be looking for such a keyboard and stop comparing them with full size and look at how good they are for general use such as posting to UMPCPortal or limited to simple ID’s and texting. Are you also going to test the sx version when it’s available?? I mean the Kohjinsha SX…. 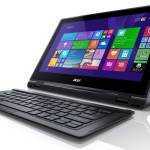 I am interested in a touch screen lap top. The Vye has my attention now. I plan to live off grid though so will need to use satellite to connect to the internet or however the phones do it. The dvd is important to me as much as the small size is. Can you recommend this computer for those applications or is there another I should look at? Thank you. I live in Canada just across from Blaine WA in White Rock.